Ideal for salads, stir-fries and sandwiches. 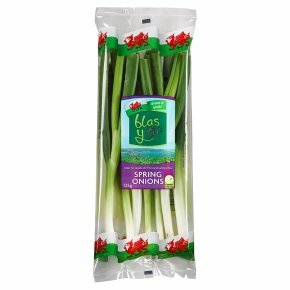 8 onions = 1 of 5 a day.Enjoy the real 'taste of the land' with our Welsh grown spring onions Grown in our rich Welshsoil and packed in Haverfordwest, our spring onions are irresistibly Welsh. 5 A Day For optimum health we should eat at least five portions of fruit and vegetables a day. How to cook Wash and trim the roots before use. Finely chopped spring onions are delicious for salads stir-fries and sandwiches.